Hotel Odisej is the only hotel on the island and it is located in the picturesque small harbor Pomena, a hart of the National Park Mljet. In front of the hotel is the beach with children's pool and beach bar, diving center, pizzeria, tavern with terrace and marina with water and electricity hook ups. 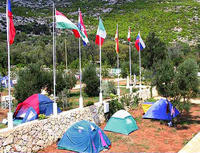 Autocamp Mljet, situated near Babino polje, is the only one camping place on the island. It is open from 1.5. to 30.9. and can accept 250 guests. For private accommodation on the Island of Mljet (rooms and apartments) you can check this list on the official web site of Mljet county. Also you can use the search. 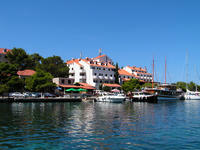 More contacts can be found on Croatian National Tourst Board site.